Honda Generator EU 20i is from the Latest & Revolutionary Honda EU series, which combines traditional Honda Engines and advance inverter technology. As a result, you get highly precised electric output from a compact sound proof generator. Honda EU-Series offers compact, fuel efficient, low-noise and inverter type generators for a wide-range of mid-sized home and professional applications, from lighting and power tools to computers and other sensitive electronic equipment. Honda EU-Series has been designed specially for sensitive equipments which requires precised output with no fluctuations. Honda EU-Series is 100% made in Japan. Honda EU 20i is the lowest noise and the most compact 2 kVa (2000 Watts) Honda Generator available in Pakistan. It offers the best quality generator you can buy in Pakistan. Honda EU 20i comes with 18 Months full Generator warranty which is exclusively available at Jawed Engineering Enterprise. For further information, visit our shop in Karachi or visit our Honda Generators Page. Browse Below For Complete Technical Specifications of Honda EU-20i Generator. Honda Generator EU 30is is from the Latest & Revolutionary Honda EU series, which combines traditional Honda Engines and advance inverter technology. As a result, you get highly precised electric output from a compact sound proof generator. Honda EU-Series offers compact, fuel efficient, low-noise and inverter type generators for a wide-range of mid-sized home and professional applications, from lighting and power tools to computers and other sensitive electronic equipment. Honda EU-Series has been designed specially for sensitive equipments which requires precised output with no fluctuations. Honda EU-Series is 100% made in Japan. Honda EU-30is is the lowest noise and the most compact 3 kVa (3000 Watts) Honda Generator available in Pakistan. It offers the best quality generator you can buy in Pakistan. Honda EU 30is comes with 18 Months full Generator warranty which is exclusively available at Jawed Engineering Enterprise. For further information, visit our shop in Karachi or visit our Honda Generators Page. Browse Below For Complete Technical Specifications of Honda EU 30is Generator. Honda Generator EU 10i is from the Latest & Revolutionary Honda EU series, which combines traditional Honda Engines and advance inverter technology. As a result, you get highly precised electric output from a compact sound proof generator. Honda EU-Series offers compact, fuel efficient, low-noise and inverter type generators for a wide-range of mid-sized home and professional applications, from lighting and power tools to computers and other sensitive electronic equipment. Honda EU-Series has been designed specially for sensitive equipments which requires precised output with no fluctuations. Honda EU-Series is 100% made in Japan. Honda EU 10i is the lowest noise and the most compact 1 kVa (1000 Watts) Honda Generator available in Pakistan. It offers the best quality generator you can buy in Pakistan. Honda EU 10i comes with 18 Months full Generator warranty which is exclusively available at Jawed Engineering Enterprise. For further information, visit our shop in Karachi or visit our Honda Generators Page. Browse Below For Complete Technical Specifications of Honda EU-10i Generator. Honda Generator EU 65is is from the Latest & Revolutionary Honda EU series, which combines traditional Honda Engines and advance inverter technology. As a result, you get highly precised electric output from a compact sound proof generator. Honda EU-Series offers compact, fuel efficient, low-noise and inverter type generators for a wide-range of mid-sized home and professional applications, from lighting and power tools to computers and other sensitive electronic equipment. Honda EU-Series has been designed specially for sensitive equipments which requires precised output with no fluctuations. Honda EU-Series is 100% made in Japan. Honda EU-65is is the lowest noise and the most compact 5 kVa (5000 Watts) Honda Generator available in Pakistan. It offers the best quality generator you can buy in Pakistan. Honda EU 65is comes with 18 Months full Generator warranty which is exclusively available at Jawed Engineering Enterprise. For further information, visit our shop in Karachi or visit our Honda Generators Page. 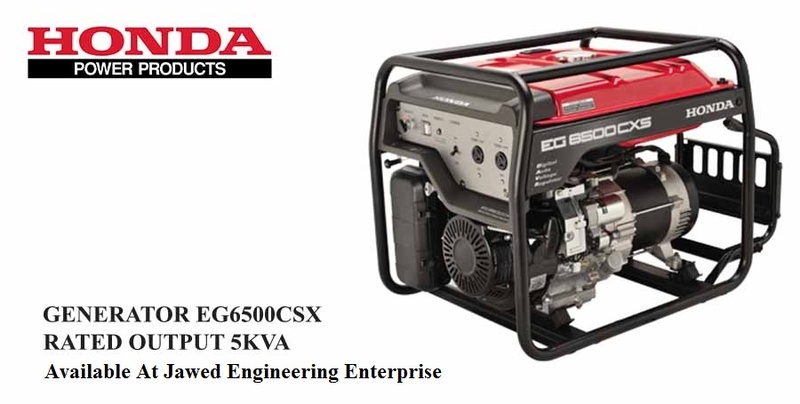 Browse Below For Complete Technical Specifications of Honda EU-65is Generator. Loncin Generators are considered to be the best available budget generators in Pakistan. Loncin generators and power products are highly reliable and high performance generators with excellent build quality. As a reliable manufacture, Loncin is initiative to undertake the commitment of partners to consumers, taking partners’ social responsibility as own responsibility. Loncin Generators have become a house-hold name in Chinese Generators in Karachi and all over Pakistan. Loncin persists to implementing lean management to promote manufacturing and quality control level, providing reliable products to customers. Loncin LC 97600 DDC comes with One Year Service Warranty which is exclusively available at Jawed Engineering Enterprise. All Spare parts of Loncin Generators are also available. For further information, visit our shop in Karachi or visit our Loncin Generators Page. Browse Below For Complete Technical Specifications of Loncin LC 9600 DDC Generator. Loncin LC 7600 DDC comes with One Year Service Warranty which is exclusively available at Jawed Engineering Enterprise. All Spare parts of Loncin Generators are also available. For further information, visit our shop in Karachi or visit our Loncin Generators Page. Browse Below For Complete Technical Specifications of Loncin LC 7600 DDC Generator. Browse Below For Complete Technical Specifications of Loncin LC 3600 DDC Generator. Browse Below For Complete Technical Specifications of Loncin LC 4900 DDC Generator. Honda Generator EG-4000 CX is powered by the powerful and the revolutionary GX-270 Engine. Designed over 30 years ago, the GX range is synonymous with reliability, efficiency, economy and power. Honda EG-4000 delivers a heavy weight punch ideal for a wide range of mid-sized home and professional applications, from lighting and power tools to computers and other sensitive electronic equipment. Honda EG-4000 is equipped with the latest D-AVR technology for continuous stable output. 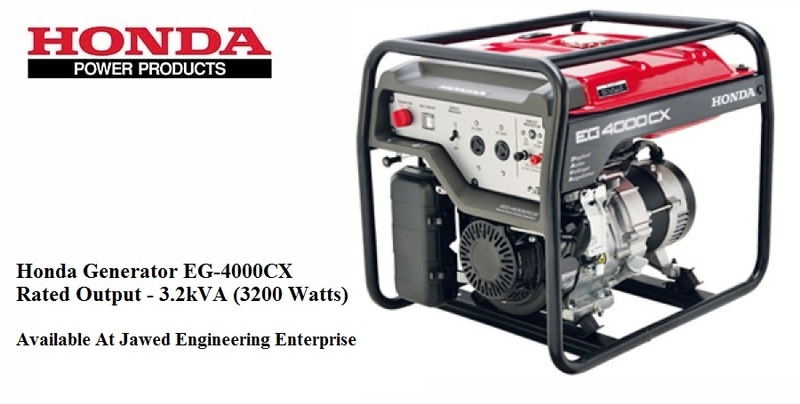 Honda EG4000 is the best selling 3.2 kVA (3200 Watts) Honda Generator in Pakistan. It is the most economical and reliable 3.2 kVA generator you can buy. Honda EG4000 comes with 18 Months full Generator warranty which is exclusively available at Jawed Engineering Enterprise. For further information, visit our shop in Karachi or visit our Honda Generators Page. Browse Below For Complete Technical Specifications of Honda EG-4000 Generator. Honda Generator EG 6500 CXS is powered by the powerful and the revolutionary GX-390 Engine. Designed over 30 years ago, the GX range is synonymous with reliability, efficiency, economy and power. Honda EG-6500 delivers a heavy weight punch ideal for a wide range of mid-sized home and professional applications, from lighting and power tools to computers and other sensitive electronic equipment. Honda EG 6500 is equipped with the latest D-AVR technology for continuous stable output. Honda EG 6500 is the best selling 5 kVA (5000 Watts) Honda Generator in Pakistan. It is the most economical and reliable 5 kVA generator you can buy. Honda EG 6500 comes with 18 Months full Generator warranty which is exclusively available at Jawed Engineering Enterprise. For further information, visit our shop in Karachi or visit our Honda Generators Page. Browse Below For Complete Technical Specifications of Honda EG 6500 Generator.